Found at Delphi, these statues are identified as funeral memorials to the mythical twins Kleobis and Biton. The story goes that these sons pulled a cart in place of Oxen to a festival of Hera, as their mother Cydippe was a priestess of Hera, and her oxen were late, so without the help of her sons she would be tardy. She was then so impressed by their devotion that she prayed to Hera to reward them. Hera listened, and rewarded the sons by letting them die in their next sleep. It seems odd logic to modern ears, but Greek culture prized the ‘beautiful death’, whereby one was killed in one’s prime, and with as little damage to the body as possible, as it was thought that one retained ones injuries or mutilations (which were common place on the battle field) into the Underworld. Thus dying in one’s sleep in the prime of one’s youth was in fact seen as the best way to die. Ancient Greeks also believed that the afterlife was far superior to the living one, and that living was simply endless rounds of suffering before one died and went on to better things. These figures are Kouroi, meaning male youth, but specifically applied to a style of early Greek sculpture. This style developed from Egyptian sculpture, which placed an emphasis on a sense of stability, and lack of originality. I do not mean this as a slight, simply that there was little experimentation, and an artist was expected to simply follow the specifications set down by those before him. This meant a strictly frontal composition, with the figure viewed from a single viewpoint from the front. A foot forward would be used to imply movement and in an attempt to give the figure some vitality. The figure would always be a young male, with idealised features, and no attempt at individualising the figure. These basic parameters of the style carried through to Greek archaic sculpture with little change. The earliest kouroi are barely different to their Egyptian forebears. The New York Kouroi is a good demonstration of this, with the large, oval eyes, and stiff body, with simple, symmetrical denotations of musculature, and fists clenched into the sides of the torso. However, Kleobis and Biton tell us about the beginnings of the development of a Greek mode of sculpture, and the move away from the strict outlines of the Egyptian. These two sculptures show the beginning of a theme that runs throughout the rest of Classical Greek art, and indeed carries through into the late 20th century. This is the beginning of the quest to present a realistic depiction of the human body. To us this may seem slightly absurd, they do not look very much like real people, and there are many elements that have changed little from the Egyptian mode. Their eyes are very oval, far more so than any human being’s, and they are out of proportion with the rest of the face. Delineation of musculature is still quite simplistic, with the pectoral muscles forming a sideways S shape across the upper body. A typical element of archaic sculpture that is expressed in the two figures is the desire for symmetry and pattern. The bodies are made up of sets of symmetrical lines. The pectorals and the Adonis belt form a triangular shape, as do the tops and bottom of the knees. The figure can be split down the centre, and the two sides would mirror each other. The love of pattern is seen particularly in the beaded hair, probably meant to represent plaits, which form very even breaks, and are divided evenly between the two sides of the head, with three plaits down each side. This is typical of the period, and would carry on until quite late, into the last of the Kouroi, in the second half of the 5th century BC. It seems that it took considerable effort and exploration on the part of Greek sculptors before they were able to discover a method of naturalistically representing human hair (efforts which were helped by changing fashions in hair styling). So given what they are trying to achieve, we might say that the sculptor of these two figures has been relatively successful, even if the precise symmetry of the hair seems a little implausible. The composition is still strictly Daedalic (a word taken from the mythological sculptor Daedalus), with a highly frontal figure, designed to be seen from the front and looking straight ahead. As we have noted the musculature is relatively unsuccessful, not only in its use as a pattern, but also because it does not show any sign of reacting to its position. The young men have their left feet forward, but their leg muscles and buttocks do not seem to react to this. However, I must be cautious in using the word ‘successful’. By this I mean successful at achieving a lifelike depiction, the aim which would from this point on become increasingly important in Greek art. That does not mean to say that these statues were not viewed as successful in their own time, when audiences were likely to have appreciated the use of pattern, and the sense of calm stability created by the symmetry of the piece, and the following of set designs. The fact that these two were found at Delphi, the most important Greek religious site aside from Olympia, in fact suggests that they were highly successful, as it would not do to present a less than perfect sculpture at such a significant site. However, we can see elements that are more successful at creating a naturalistic figure than in earlier pieces of the style. These are chiefly noted in the use of the ‘Archaic Smile’. This is a device whereby the figure is given an obvious, almost cartoon-like smile. They are quite simple, and in no way reflect the complex movement of many muscles which is required to produce a human smile, but they attempt to give the figure a sense of vitality, of having thoughts behind the eyes. These figures are two of the earliest on which this smile is apparent, and are certainly the most famous early examples. 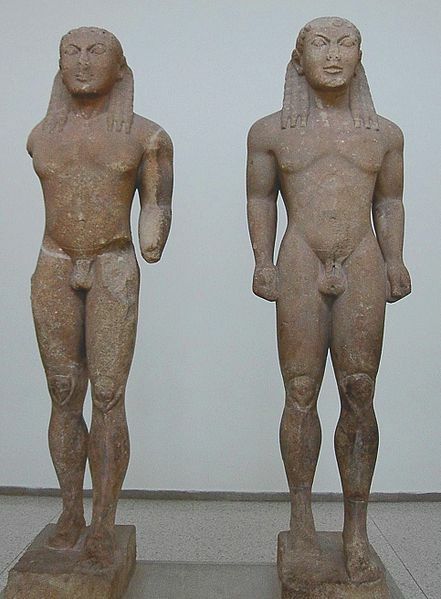 When comparing these figures to the earlier Kouroi, say the New York Kouros, it is clear that this simple device has made some difference to how we perceive the figures. They may now seem a little gormless, but it is easier to think of them as people, rather than simply stylised representations of different parts of the human body. The knees are also more rounded than those of earlier Egyptian examples, there is more of an attempt to create an image of a knee, not simply a pattern standing as symbol for a knee. The undulation around the knees particularly shows the attempt to display anatomy, and the way different parts of the knee fit together. Though these elements are only small, and when considered in the grand scheme of developments in sculptural representation of the human figure, seem very small, they are key in teaching us about the early origins of a Greek style, separate from, and more realistic than, that art of the Egyptian civilisation, and taking over from this style as the dominant influence in art. It is only in its early stages, but the artist is clearly moving away from pattern towards creating a human form, and we see the beginnings of the change in objective, from creating beautiful patterns, towards creating beautiful people.